I love Steve Martin. The first time my wife visited my house when we were dating, we watched The Jerk. He is a damn national treasure. I was interested in the reading this book for some time now, six years according to Goodreads, and it was not quite what I was expecting and yet I loved it all the same. This book seemed almost like Martin wrote it reluctantly and somehow I enjoyed that. I suppose I expected Born Standing Up to be a typical memoir type book filed with anecdotes and funny stories. That is a part of this book. Martin recounts growing up in California and working at Disneyland, learning magic tricks, and falling in love with performing. More than that though, Martin really captures how hard he worked to become the Steve Martin that we all know and love. In the late 60s and early 70s, Steve began experimenting with a different type of comedy, one without punchlines with incredible pacing. He talked about the years he spent developing and refining his act while writing for the Smothers Brothers and Sonny and Cher, among others. He details the struggles he overcame without pomp or ego. He narrates the book himself and sprinkles in some of the very jokes he describes in a very funny, very meta way. 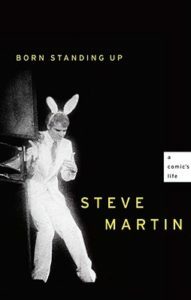 If you like Steve Martin read Born Standing Up. If you don’t like Steve Martin, well then excuuuuuuuuse me!